A peer review assignment enables students to provide feedback on another student's assignment submission. Peer reviews are a tool that allows communication between students and can help students master the concepts of a course and learn from each other. Peer reviews can be assigned to show student names or display anonymously. When you or a TA create a peer review assignment, you can assign peer reviews manually or you can have Canvas assign them automatically . Group assignments can also be assigned peer reviews. If the assignment is not an On Paper or No Submission assignment type, students can also view the peer review information in the sidebar of the assignment details page. To complete a peer review, students must review the assignment and leave a comment on the submission details page . You can also assign a rubric to the assignment. If the assignment includes a rubric , students must only complete the rubric to complete the peer review. However, you can choose to ask your students to also leave a comment in the comment sidebar. The rubric score is used for an assessment opinion only; you must review the assignment and assign the final grade. Students do not receive a grade for completing a peer review. If you want to assign extra points for peer reviews, you can create a No Submission assignment in the Gradebook and assign points manually. The Peer Review page for the assignment will show the names of students who have completed the peer review. 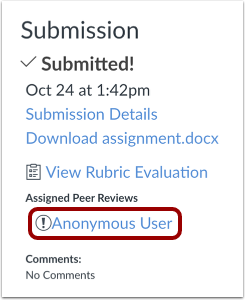 As part of creating a peer review, the anonymous option allows you to hide the name of the student reviewer from the student with the submission. The reviewer cannot see the name of the assigned person whose work is to be reviewed, and the student who submitted the assignment cannot view names associated with any comments. Email notifications sent to students about peer reviews are anonymous. Student reviewers cannot view the name of the person whose work they are reviewing. Once a peer review has been assigned, the viewing setting cannot be changed. For instance, a regular peer review cannot later be made anonymous—and appear anonymous—unless the peer review is deleted and re-assigned. 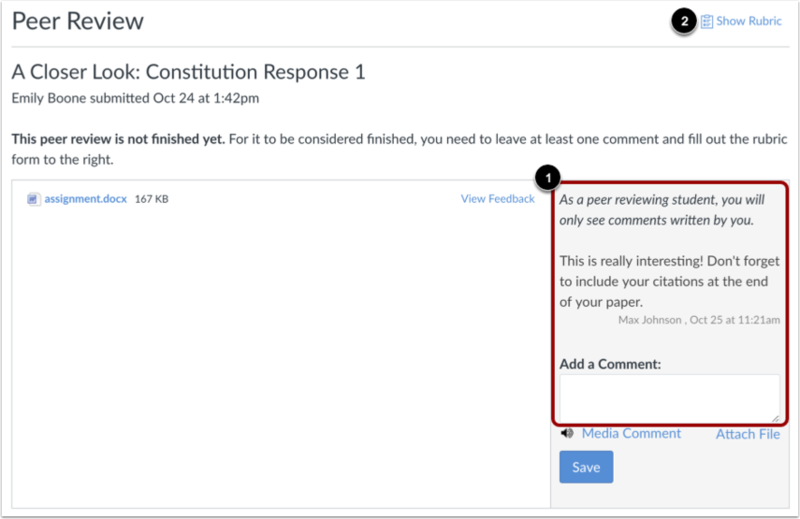 Canvas DocViewer does not support anonymous comments, so it cannot be used for annotated feedback on assignments with anonymous peer reviews. When anonymous peer reviews are enabled, you and your TAs can still view the names of student reviewers in SpeedGrader and in the student submission page. However, if anonymous grading is enabled in SpeedGrader, the names of both students will be hidden in SpeedGrader but not in the student submission page. Previous Topic:How do I upload all student submissions for an assignment? Next Topic:How do I create a peer review assignment? Table of Contents > Assignments > How do I use peer review assignments in a course?